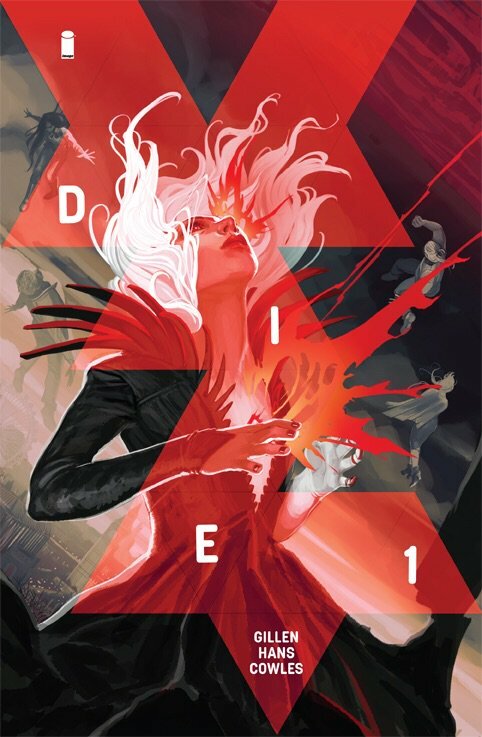 "Goth Jumanji": Kieron Gillen and Stephanie Hans talk their new Image series, 'DIE' – AiPT! DIE from Image Comics is a fantasy comic that takes inspiration from Dungeons & Dragons and Jumanji. The book revolves around a group of teenagers who meet for a roleplaying party. The six vanish and disappear for two years. When they suddenly return, all of them refuse to talk about what happened. AiPT! spoke with Kieron Gillen and Stephanie Hans about their latest series. AiPT! : What was the inspiration behind DIE? Kieron: The specific idea came at San Diego 2016. Jamie, Ray Fawkes and I were wandering around buying ice creams and just riffing. I said “I wonder what ever happened to those kids in the 1980s D&D cartoon?” We joked around it a bit – historically, they escaped in the last episode which they never recorded – and just thought of these people who’d survived a D&D game gone wild, now well into their adulthood. So we made some jokes, and carried on eating our ice cream. It stuck in my head all day, and I chewed it over, had some more ideas, and by 8 PM I burst spontaneously into tears during dinner when I realized what the story was about, and it instantly jumped up to the top of the list of Stories I Had To Tell Immediately. I threw the other story in the bin, pitched DIE at Stephanie, and started all the research I needed to do. AiPT! : How would you describe DIE? Kieron: We’ve edited a three page trailer, which is what we’d lob in front people to get the vibe. Go read it. It’s got Stephanie’s pretty art. My jokey two word pitch is “Goth Jumanji” which cuts to the chase. More accurate would be “Jumanji as horror” including that overly precious phrasing, but “Goth Jumanji” is much funnier. AiPT! : DIE has a dreamlike quality that is perfect for the book. What influenced the art of DIE? Stephanie: There are a lot of influences in the creation of the aesthetic of DIE. First of all, it is a tribute to the illustrators from the ’70s and the ’80s who were working for the French comic market where fantasy was huge at that moment. It is very ambitious for a monthly but my model would certainly be gravitating around la quete de l’oiseau du temps that I read when I was 23 which literally made me cry. I absolutely loved seeing the drawings of the artist (Loisel) changing from that typical way of heavily inking from the ’70s to something very pure and clean, graceful. There is also the work of Angus McBride who was a fantastic technical illustrator, mostly for Osprey (military books). Those books are an absolute reference for anyone who wants a bit of serious in designing uniforms, armors, warriors, from all ages and origins. For the covers, I am sure I have to thank Marko Djurdjevic whose early work was a heavy mix of illustration and graphism. It was so inspiring. I certainly can also pick some works from Yoshitaka Amano, designer or the first Final Fantasy games. And yes, John Howe, art director of the lord of the rings and official illustrator of Tolkien, whose work is always grand and dramatic. That’s a lot of people to name, but there are certainly even more that I forget. What you draw is always only the continuation of whatever made you an artist. It’s a life plus this drawing. AiPT! : DIE has a myriad of emotions: nostalgia, fear, uncertainty. Beneath everything is a strong sense of mystery. How were you able to effectively combine so many feelings? Kieron: We’re kind of amazing. AiPT! : After never playing D&D in my life I recently joined a D&D club. How can I avoid vanishing for years? Kieron: Sorry, it’s too late for you. Disappearing for years is part of the fun. And welcome aboard! I hope you’re enjoying yourself. It’s a hell of a thing to get to do. AiPT! : What can readers expect from DIE? Kieron: Pretty much everything. The book’s a lot. It’s a personal drama of these six complicated people. It’s a deconstructionary comic that clinically unpacks the root of roleplaying and modern fantasy in the way Planetary dissected the superhero. It’s got high adventure and romance, and a bleak mood that just doesn’t stop. Hell, I’ve done a supplementary RPG for it which we’re planning on releasing around the time the trade drops. It’s a lot. It really is a lot. The response most folk have had to reading it is “it’s darker than I was expecting.” This isn’t just in the occasional horror trappings – it’s the emotional directness of the book. It’s a fantasy book. It’s all too real. AiPT! : What future projects do you have? Kieron: Stephanie is working on DIE for the foreseeable future, and I’m with her. I’ve got Peter Cannon: Thunderbolt launching over at Dynamite, which is a playful deconstructionary superhero comic, and I’m enjoying enormously. I’m moving towards my climax of Star Wars over at Marvel. Oh — and an unannounced thing.